After a night in Rondavassbu I awoke to the stale funk of drying gear and returned hilwalker. A familiar soundtrack was playing in my head, it was the sound of a fat lady singing . The trip, so long in the planning, was all but finished. Breakfast was followed by a short but pleasant enough walk out to the car park at Spranghaugen. Even on a road, It should have been a real joy to walk through more kilometers of this wonderful landscape but as always my mood has changed. I just want to get the journey back to the Netherlands over and done with. As we approach the car park we pass a very large group of people. People of all sorts. All shapes, and sizes. All ages. Apparently also all levels of preparedness for the outdoors. Many look like they won’t get past Rondvassbu. Our experience of the last few days suggests that this is the case since we've seen remarkably few people. I catch myself in a negative line of thought. With a virtual sneer I think that most of these people won’t see the side of Rondane that I have, that they won’t learn to appreciate Rondane in the way that I now do. However, there’s no room for condescension in this game. Appreciation of these places is so individual. Each gets their own thing out of it and should be left to do so on their own terms. Even in our small group of like minded people, expectations and ambitions differ widely. The journey back is uneventful. Train, plane and car from the airport gets me home in time to put Emily to bed. I re-walk the route as we travel but, I know that, as is always the case, my perspective will change with time. As I write this piece I’m looking back at the Rondane through the haze of two months of normal life: busy weeks at work, changing nappies and a family holiday. So how does it all look now that the dust has settled? Well firstly, I wouldn’t hesitate to recommend Rondane to anybody. If you’re prepared to fly, It’s relatively accessible (connections permitting, an early start will have you on the hill on the same afternoon). The area itself strikes me as being suitable for many (but not all) levels of experience and ambition. There are well marked routes that are easy to follow and manned huts that are well provisioned. Ideal for the less experienced or those looking to travel with a light pack. The inexperienced should nevertheless be aware that it’s a remote and mountainous area, high and a long way north, and as such should be treated with due respect. For those seeking more adventure Rondane certainly offers much. The high tops are spectacular places to be and there’s plenty of opportunity for linking them up into the biggest of hill days. Those looking for scrambling and exposure will not be disappointed. If things go the way of the pear the DNT routes and huts offer opportunity for bail out. In my view, the cream of the area is it’s empty center. The three valleys extending from the northern side of the Smuibelgen massief and into the Doralen: namely the Langholet, the Verkilsdalen and Smedbotn are places I could revisit time and time again. In short, they offer what I’m looking for: a strong feeling of wilderness and the north country. But what of our trip? Well, in retrospect it ranks amongst the best I’ve undertaken. That’s not to say that we got everything right. The route taken was a long way off the route planned. A combination of conditions and terrain underfoot put the planed route out of our reach. I don’t consider that to be a problem though. Planning doesn’t stop when you leave the house. Unpredictability of weather and many other factors will, in my experience, always require decision making on the ground. In Rondane we were forced to make more, and further reaching, decisions on the fly than normal. Old snow, boulder fields, hot weather and the poor availability of water proved to be determining factors which pushed the group to it’s limits on occasion. Nevertheless, whilst we didn’t climb all the 2000m peaks nor cover the kilometers planned we had three full days on which we couldn’t have achieved much more than we did. All in all we used the time available to full effect and I for one left Rondane fulfilled. It also has to be said, knowing what I now know, I wouldn’t trade in the second day through the Langolet and Doralen valleys for all the 2000m peaks in Rondane I’ve not yet done. Shelter: Given a good forecast I think (as has been suggested already by Roger), that when planning to camp high, the bivvy bag is the best option for Rondane. Above 1400m or so suitable sites are few and far between. Even below the vegetation line, placing tent pegs proved difficult and I expect a free standing design would be the best choice of tent. Even so, sites sufficient to accommodate the footprint of even a modest tent did not appear numerous. The bivvy bag is of course not the best choice in the face of wet weather and mosquitoes. In sustained wet weather the bag can be exchanged for a bed in a hut. Mosquitoes are more difficult to avoid (they were still active at 1400m in July) but sleeping high and praying for wind is the best policy. Water: Availability of water above the 1600m contour is very limited. Carry enough water if you are heading high. If conditions permit then melt water may provide an additional source but be aware that it is deminerlised and consider carrying additives such as isostar to prevent cramps. Terrain: DNT routes are well marked and well trodden and allow ground to be covered in good time. Off paths the terrain is hard going. 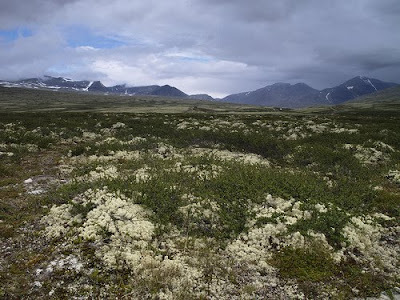 Below 1400m low growing vegetation (bilberry, dwarf birch and thick reindeer moss) saps the energy. Above this height expect either scree or boulder. Boulder fields in particular kill the pace and can be extensive. In some cases we spent the better part of half a day crossing a single expanse of boulders. Unlike British OS or Harveys maps the (otherwise excellent) 1:50000Turkart doesn’t provide an indication of the conditions underfoot. Season: Although not so extensive as in other areas old snow was still present in July. For the most part this didn’t pose a serious problem but it was a factor which contributed to the decision not to undertake an exposed traverse (Storsmeden-Veslesmeden). Late Summer/Early autumn may be a safer bet. Later in the season would also potentially be better with respect to mosquitoes and scenery. Rondane is renowned for autumn colour. I found your trip report fascinating: Many thanks. I shall use it as a constant source of reference and inspiration. Kind words! Glad you liked it. Great wrap-up, Dave. I'm glad to hear that in the end you came home fulfilled. Rondane in autumn, that would be now! Really enjoyed the whole article, and in some free time I will read the whole story from beginning to start again. Dave - that feeling of a trip coming to an end is sickening isn't it? I find the best cure is to start planning the next one! Thank you for sharing. Hendrik: Right. Now is the right time to be in Rondane! The whole thing is in SCRIBD and is downloadable. Only the gear reviews to go. Holdfast: You're welcome. Thanks for dropping by. Yes the let down at the end of a trip is always tough. I now have mixed emotions because I have small kids and it's nice to come home. This time round I was met at Schipol by my 2 year old daughter. It was after her bed time and she was in her PJ's but she wanted to see pappa come home from teh mountains. That softend the blow somewhat! She now thinks Norway is through the sliding doors at Schiphol. A genuinely captivating narrative. Thank you. Your prose captured the milieu of the Rondane, ably assisted of course by moody photographic imagery, in a manner rarely seen outside of professionally published work. I anticipate even more enthralling stuff as I wend my way through the archives of your blog. It's gratifying & useful to have such a comprehensive account of places few readers will have been - conversely, I kept my narrative of our jaunt up Scafell Pike, Esk Pike & Bowfell short as so many will have seen and done identical routes that it seemed pointless to detail the minutiae of an easy trip with few difficulties. I also identify with your self-deprecating and self-effacing demeanour! I've been teetering on a precipice, over the edge of which lay the world of bivouacs and tarpaulins. I fear your chronicle may have seduced me into jumping as I am certain opportunities to pitch my Fly Creek UL1 would have been limited, both in terms of space available and the sensitivity to the durability of the UL groundsheet on the rocky Rondane floor. I'll contact you directly if I may with queries. Gratitude also for the kit reviews. I share your scepticism of their usefulness, being so subjective, but with that in mind, I'm firmly of the view they have a place and taking the time to detail them so comprehensively is well-received. One thing that did strike me about reports like yours is that they could do with the route mapped out in an image - I imagine there are copywrite issues but has anyone ever asked...? Maz, Praise indeed. Rondane is an easy place to get enthused about. Glad you enjoyed the trip report and even happier that it may be of use to you. Feel free to drop me a line as and when you have questions. I'd originaly planned to do more by way of kit reviews but the blog (blogs in general?) has a life of its own and has become much more about trips and the emotions they stir in me. I'll keep doing the odd kit review, like you I do believe they have a place, but they'll mostly, be buried in trip round ups. I'm going to have a scout round the net looking at bivvy bags - if you were buying again, for the sort of hiking you did in the Rondane, what would you get? Good question and a good question deserves a considered answer. Rondane aside for a moment a lot depends on whether you intend to use it, as a stand alone shelter or combined with a tarp. If you´ve got a shelter over your head you can go much lighter. A bag cover such as the Terra Nova Moonlight would then be high on my list. If you want to use it as a stand alone then I would say you´ve got to go for event or goretex with a zip closure. Again I like the terra nova bags, the discovery for instance, but OR and RAB make similar bags, Unless your talking about hooped bivvys, once you´ve chosen the fabrics, theres not that much to differentiate bags in my opinion. After all they are basically just bags and you need one that fits. Expecting insects then you want some mesh across the opening. Mountain Laurel designs can´t be beaten for their range of bags, options and potential for customisation. How you sleep will influence whether you suit a crocodile and top opener, I lean towards the latter since I find I can sleep with my head covered whilst keeping the zip largely open. I´d advise to buy big so you can get your mat inside the bag. Hoops or no hoops. I´ve always maintained that yiou can better carry a tent tna a hooped bivvy you get so much more shelter for the weight. PTC has good things to say about the BA three wire bivvy though. Back to Rondane, I went with my MLD Alpine Bivvy in event with silny floor. At the time I bought it in 2007 I concluded it was the lightest full-on bivvy available at 360g. I´ve used it in pretty wet conditions and it stands up to it well. You have to seam seal it yourself. Its always kept my down bag dry apart from a little condensation at the foot end and around my chest from my breath when I´m sleeping with it closed up. My only gripe is that I don´t think it´s as warm as heavier bags. My experience is that when exposed to wind, the thin material conforms to your body shape and your insulation gets squeezed. Heavier bags, like my TN Discovery, 724g, offer more resistance. I´m also pretty defensive about the ground sheet which I think on rocky ground may meet its match. So what would I choose again if I was off back to rondane? I might be inclined to leave the tarp at home, then I´d probably pack the heavier bag. In terms of weight there´s little difference but the TN bag is truely bombproof. Just a bivvy and no shelter in an area like Rondane? I think it´s an option if the forcast looks good, it lets you travel light and sleep high and I would maintain that viable tent pitches are few and far between out of the valleys. Should the weather turn out to be less ideal and you get dealt a wet night then you can always head for a hut.